Note: Although the generator uses a crystal for its timebase, the error can be as much as one second every 9 hours and still be within the crystal spec, so it's nowhere near accurate enough to be used for timekeeping. This generator was created to help debug some WWVB-slaved clocks which I designed a few years ago. Since the WWVB signal is often not usable during the day, especially on the East Coast, I found myself working late at night and thought there must be a better way. A 6.00 MHz crystal is divided by 100 to create the 60 KHz WWVB carrier frequency, and then divided further to create the 100 mSec intervals which control the timekeeping and data pulse timings. Timekeeping should be reasonably accurate, but nothing even close to WWVB, of course, and could be off as much as a few seconds each day. The twice/hour phase modulation of the WWVB carrier is not implemented. 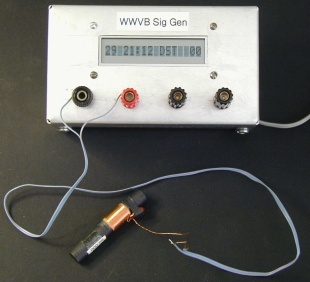 This photo shows one implementation of the signal generator. The left two connectors provide the WWVB 60 KHz amplitude-modulated signal, which feeds a 60 KHz resonant ferrite rod antenna. The other two connectors are for T0 (once per minute) sync and the un-modulated WWVB data stream. Left LCD digits always show seconds value. Time is displayed next. The right part of the display rotates through the remaining fields, displaying each for 10 seconds. Three pushbuttons (not shown) on the top of the case allow selecting one of the data fields, and increasing or decreasing its value. I have been able to sync several different clocks to the generator at distances of 12" or more. Probably with a different antenna, and perhaps a slightly different driving circuit, the range could be increased. The generator is competing with the real WWVB signal, so at night it may have to be much closer than during the day. For my purposes, requiring the generator's antenna to be close to the clock under test is not an issue, but it may be for some people. What I am offering is only a PC board with the components needed to populate it, and the 60 KHz ferrite rod antenna. You will need to supply a 9VDC wall adapter, some sort of enclosure, 1x16 LCD module (w/HD44780 or equivalent driver chip), connectors for the front panel, wire, rubber feet, etc.